Not my favorite Shakespearean play, I have to admit, but a fun little show that depends on the actors involved to transform the rather harsh tale of how to put down men and one man in particular into a lightfooted comedy. Luckily there’s no shortage of brilliant actors in Stratford! So with Laura Condlln and Lucy Peacock as the wives, my favorites Tom Rooney and Tom McCamus as the husbands and finally Geraint Wyn Davies as Falstaff you are in for a very special treat! The interweaving storylines are probably very well known: on the one hand you have Falstaff – his belly is almost as huge as his ego -, whose only shortage is in money. So in order to become fluent again and pay for his lodgings, he decides he will woo two married women and make them his east- and west-indies as they surely would want to pay both for his affection and to keep their affairs secrets from their husbands. On the other hand you have young mistress Anne Page who has been left 700 pounds and therefore is the perfect match for more than just one young or not so young man. The three contenders for her hand in marriage are one simpleton, a doctor and a young guy who actually does love her. So we have Falstaff (Geraint Wyn Davies in a fatsuit and absolutely hilarious) writing letters to the two wives, not knowing they are best friends and offended by his advances and plot to get their revenge. Which will also be a revenge on Mistress Ford’s jealous husband.Who comes to Falstaff in a disguise to check if the fat man will actually be able to turn his wife into an adulteress. Therefore when Falstaff arrives at Mistress Ford’s home, the husband is already alerted but outwitted by his wife and her friend and co conspirator Mistress Page. This happens not once, not twice, but three times and at the third time both husbands are in on the plan, as are half the people of Windsor. therefore Falstaff is once again in for a nasty surprise, but so are both parents Page – because their daughter has other plans than to marry either an old doctor or a young dumb. She elopes with her true love and comes back married – as does the doctor who unwittingly tied the knot with a boy! The play itself had been commissioned and demanded by Queen Elisabeth herself – she loved the character of Falstaff so much she wanted to see him in love – well, obviously Shakespeare had other intentions, but he delivered a Falstaff-centered play. And therefore what you need is a very good Falstaff – take for instance Geraint Wyn Davies! He lost 20 pounds since last year to make King Arthur in Camelot perfect (talk about method acting – all the girls at the theatre wanted to know just WHAT his secret was to lose that much weight) but now has to put on a fatsuit for every #ssfMerry performance. Which luckily isn’t all that heavy – but it’s HOT in that body suit. He perfectly combines the surprising nimbleness of a fat man with the unavoidable immobility of any large man and he is hilarious – not once does he forget to heave himself out of a chair, and when he tries to fit under the table, he really has to work to get his bum covered too. While the two wives loudly discuss his fate at the hands of their husbands, he rolls out from under the table and like a bug on its back is not able to get up again. I pity the part of the audience right in the middle of the stage as they can’t see how Geraint is milking this scene – I was sitting a little to the left and was wheezing helplessly with laughter at his antics. When he’s finally changing into women’s clothes for one scene it is just screamingly hilarious how he stomps down the stairs and then gets beaten up, again rolling helplessly on the floor until he/she finally manages to escape. Again it is a part for Wyn Davies to prove that his comic timing is impeccable, his interaction with the audience on various occasions just hilarious and his delivery spot on. He turns a rather dusty comedy into a sparkly bright show filled with fun and laughter. There have been some snippets on youTube and an article on Geraint’s parts that I will gladly add here. If he’s back next season, so will I! 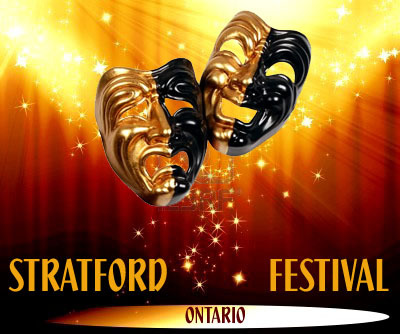 This entry was posted in Stratford Festival Ontario and tagged Geraint Wyn Davies, laura Condlln, Lucy Peacock, Merry Wives of Windsor, Stratford Ontario, Stratford Shakespeare Festival, Tom McCamus, tom rooney. Bookmark the permalink.